The Dubois Cup again took place at Porto Cervo from the 4th to the 6th of June. The regatta, now in it’s second event year, was established in 2007 solely for Dubois yachts. This year saw fourteen Dubois-made superyachts arrive; eight of which raced. 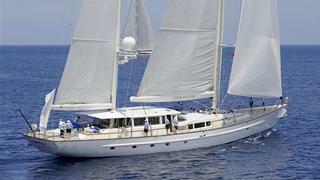 Racing yachts included Twizzle, a 57.5m new build launched this year. The famously intricate coast around Porto Cervo provided the backdrop for racing, but the first day of racing was frustrated by a day of showers and light winds. The bad weather was due to exceptionally low pressure, according to Yacht Club Costa Smeralda sports director Edoardo Recchi. As a replacement for the competition of racing, superyacht crews found another diversion. Rumour says that the crew of the 40-metre Tenaz first fired water bombs with slingshots at the new ketch Twizzle. The battle spread to the entire fleet. Monday saw the yachts back to business, as weather conditions grew more favourable. A midday pursuit race took place, with each of the impressive sailing yachts turning the Monaci lighthouse as they overtook each other in competition for the leadership. The vintage Dubois Timoneer took advantage of the worsening wind conditions. She won through the tactical decision to gybe and take an inshore course in conditions that should not have favoured her. "You've got to be either clever or lucky to do what we did, and today we were both," said her jubilant skipper and helmsman, Phil Wade. Sixth placed yacht Drumbeat’s captain Michel Personnic admitted "everybody wanted to beat Timoneer today." 2009 winner Ganesha was given a five minute penalty for crossing the start early. Including this penalty, she lost out on first place by two minutes, achieving fourth place after Zefira (third place), and Nostromo (second).